I don’t know about you but whenever I go and do a toiletries run in Boots I go in for a few things (like razor blades) and come out having spent over £50, what on I’m never quite sure. Damn those 3 for 2 offers. Shaving has never been something that I’ve looked forward to, one of those annoying chores that has to be got out of the way. As a teenager I used to lacerate my acne ridden face with disposable blades until I looked like Freddie Kruger. I also really resent going out and spending money on shaving stuff, I feel like it can often be overpriced and theres so many different types of blades it’s hard to tell your Mach from your Fusion. So when the team over at Cornerstone sent me over a shaving kit I was intrigued to see how it would measure up. Just to be clear straight away Cornerstone sent me this kit for free in exchange for me writing an honest review. I wouldn’t endorse anything that I don’t like so you can rest assured that all views below are my own and 100% truthful. In a nutshell they offer a shaving kit delivery service supplying everything from the razor itself (more on that later) to face scrubs, shaving gels, moisturisers and even wash bags. You can choose which combination of products you want and how often you want them delivered (from every six weeks if you shave daily to every 18 weeks if you shave now and again). 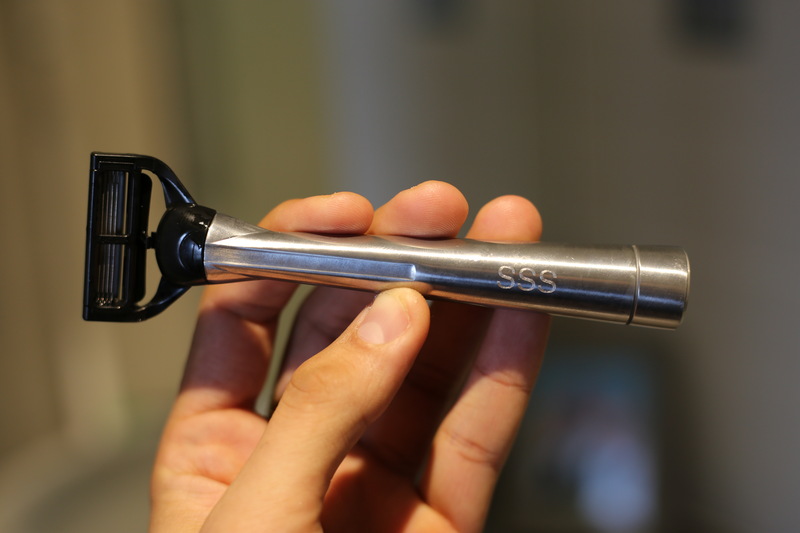 The razor handle feels like quality – like a big manly lump of solid metal. You get the razor free with the first order and what’s more exciting is that they engrave your initials onto it which is a really nice touch I thought. Having something personalised is always just nicer isn’t it? It’s still lightweight enough to handle it easily but it just feels a bit more solid and substantial than some of the other razors out there. Pre-Shave Face Scrub – Cedarwood and Volcanic Sand: This was thick and rough as you might expect from a scrub. Rubbing it into the face you definitely feel like it is getting into every nook and cranny. It’s not really scented just a bit of an earthy smell but that leaves you feeling like you are getting a proper clean. My skin definitely felt like it had been prepared afterwards. It’s probably a bit thicker than a lot of other exfoliating scrubs out there, but I think if anything this made it feel more quality. Sensitive Shave Gel – Ginger and Eucalyptus: This smelt nice and made a slight lather although not as much as you often get with such products – this is explained on the tube itself saying this is the way it is designed, ‘low lather – but highly protective’. I actually found the lack of lather quite handy, I don’t shave my entire face just my neck and checks and so it made it much easier to be able to see the bits I needed to shave without a cloud of suds getting in my way. What can I say – I was impressed, seriously impressed. The razors are sharp and just glided down my neck without any resistance at all, whilst keeping completely flat against my skin (something to do with the way the head was fitted I would imagine). It meant I was able to shave very quickly and with excellent precision. Even nowadays I struggle to shave without springing a red leak somewhere but on this occasion there was none. The whole process with the different lotions to put on left my skin feeling clean, smooth and fresh afterwards and as I write this a couple of hours later it still feels the same way. To find out more about Cornerstone you can visit their website. 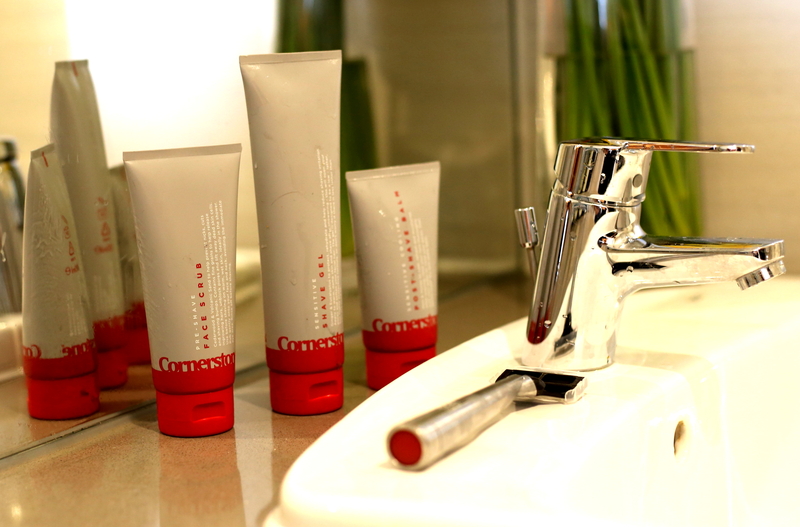 COMPETITION ALERT: Keep an eye out on my Instagram page as I’ll be announcing a competition to WIN A CORNERSTONE SHAVING KIT (the same as the one above) in the next couple of days!